Murder on the Orient Express, I suspect, is one of the more intriguing murder mysteries in Agatha Christie’s perennially popular oeuvre. Set on a world-famous train that breathes old-world charm, with an international hodgepodge of passengers that includes cosmopolitan aristocrats, their attendant servant class, and various persons of interest, the murder of an American businessman, Mr. Ratchett, alias Cassetti, sets off a whodunit that sweeps up the entire clientele of the Calais coach in its investigation. 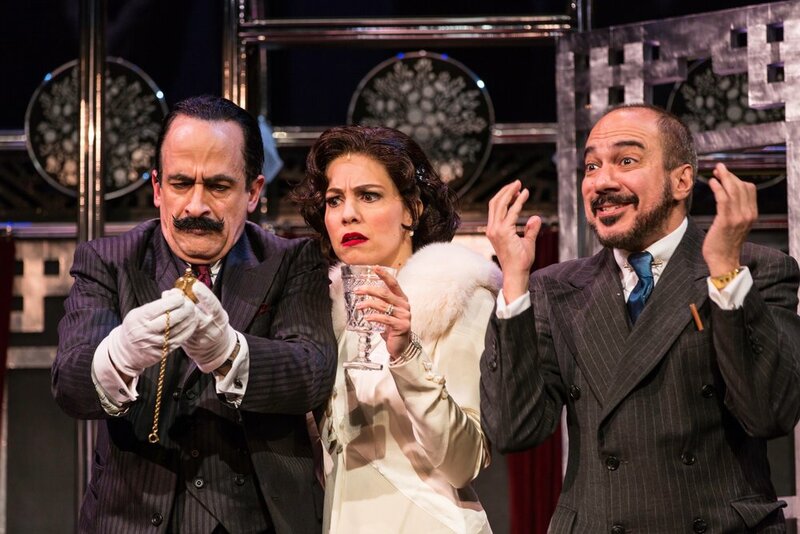 Helmed by the redoubtable detective Hercule Poirot (David Pittu), the sleuthing entails red herrings and aliases, some more questionable than others. First published in 1934, Christie’s original novel, adapted for the screen in high style in 1974, directed by Sidney Lumet, boasts a canny sense of how a complex killing could be carried off on a snow-bound train in close quarters. 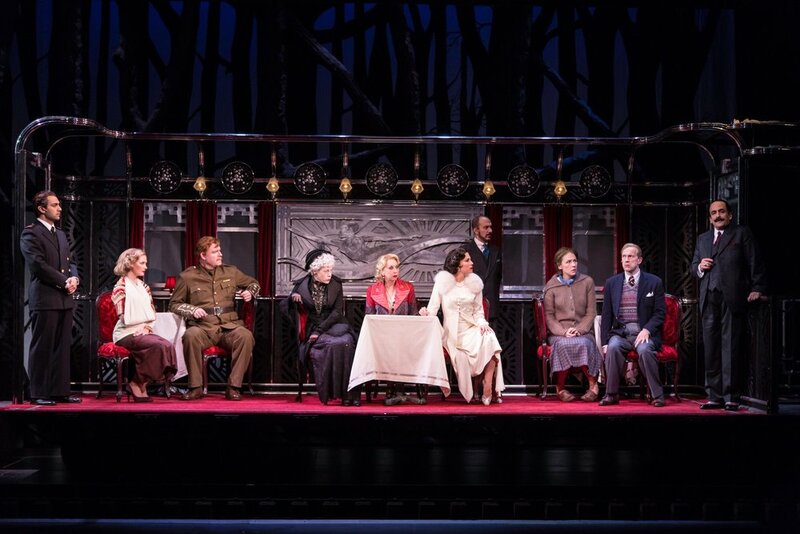 Ken Ludwig’s adaptation for the stage, directed by Emily Mann, includes a few nods to the beloved Lumet film, and boasts its own canny sense of how to fit a couple elaborate railway cars, housing a cast of 11 actors in 13 roles, on the stage at Hartford Stage. In this sumptuous production, first staged at Princeton’s McCarter Theater, the main artistic features are the stylistic brio of William Ivey Long’s costumes, the detail of Beowulf Boritt’s sets—including the use of curtains to suggest framing as in a film and even a sense of panning—and mood-creating lighting, sound, and music for a richly achieved world. The main entertainment is provided by the character-actor turns, as Ludwig’s heterogeneous characters, most adapted mostly faithfully from Christie, some by way of the film, try to convince Poirot they are not other than they seem. The levels of deceit vary, and we soon begin to wonder if anyone is telling the truth and what each is trying to hide. A key clue early on lets us know (if we don’t already) the identity of Ratchett (played as an uneasy tough guy by Ian Bedford), and, from then on, it’s a matter of determining who fits into the backstory and how. That backstory involves dire unpleasantness involving an unfortunate little girl named Daisy Armstrong (Jordyn Elizabeth Schmidt), her rich parents and their staff. That crime’s distance from the present action lets the murder on the train be allowed its comic elements as its victim is someone no one would mourn. Still, the solution of the murder, which makes for a great set-piece in Act Two, complete with spotlighted flashbacks, creates an ethical quandary for Poirot (though one not nearly so tiresomely tendentious as in the recent film adaptation, directed with but scant grasp of the material by Kenneth Branagh). The big question here is whether the elaborate revenge on Ratchett is the perfect crime. Doubtless it would have been, if only Poirot, played with self-involved panache and a wry sense of human foibles by Pittu, hadn’t been given a berth on the train last-minute by M. Bouc, Poirot’s dear friend and the manager of the line (played by Evan Zes as a florid and anxious Watson). Poirot’s presence brings out a parade of striking attitudes by those whose mere presence in the coach makes them suspects. Among the best are Julie Halston as Mrs. Hubbard, a brassy, oft-married (as in the film) American with a love of Broadway; Veanne Cox as the gruff Princess Dragomiroff, a relic of another time full of captious commentary on her fellow travelers, particularly Mrs. Hubbard; Leigh Ann Larkin as an elegantly gowned and lovely former doctor (Ludwig’s touch) now married to an absent Hungarian count, who helps Poirot with medical know-how and nearly turns his head; and Ian Bedford as blustery Scotsman Colonel Arbuthnot and the unprepossessing Ratchett. Samantha Steinmetz plays Greta Ohlsson, a Swedish missionary accompanying the Princess, with the meekness Ingrid Bergman earned an Oscar for giving her in the film, but with an accent that would doubtless make Poirot question her bona fides in real life. Rounding out the cast are Juha Sorola as Hector McQueen, a prickly assistant to Ratchett, Maboud Ebrahimzadeh as Michel, the conductor with a secret, and Susannah Hoffman as Mary Debenham, a young governess in a romantic intrigue with Arbuthnot. A surprising act of violence against her comes as a distraction for Poirot and a somewhat gratuitous Act One climax. Christie’s is a world in which murder, however alarming to the innocent and unfortunate for the deceased, has its set target and its deliberate—and recoverable—enactment. The enactment is everything, we might say, and this Murder on the Orient Express steams along with a sure pace and enough visual and verbal variety to maintain interest—even if you already know the culprit. Ludwig, well-known for comic works such as Lend Me a Tenor, The Game’s Afoot, and Baskerville, was commissioned by the Christie estate to adapt the novel for the stage. The playwright does a fine job of trimming excess and keeping the interactions coming, and his script is at its best as a banter of jibes and jabs among a group of people we would be surprised to see in the same restaurant. Mann’s direction doesn’t go too far into campiness—though I wouldn’t complain if it did—and there’s no effort to give Christie’s characters a deeper psychology. With murder mysteries, everyone is only as complex as their motives, and here the motive is a mighty vehicle indeed. As a glimpse of a bygone age, Murder on the Orient Express offers welcome romance and its plot’s stodginess is also its charm. 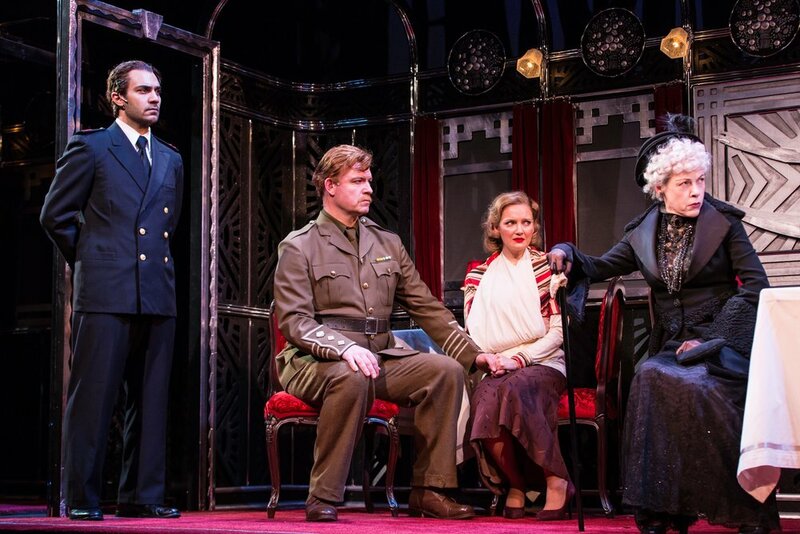 Ludwig’s best touch is letting Poirot open and close the show by addressing the audience, so that the entire play is framed as the memory of a brilliant but also fallible man looking back on a troublesome case. Pittu’s Poirot orients us toward the question he would like to express: is a deliberate killing ever justifiable? The play is light-hearted enough not to take its doubts too seriously, but the question remains.